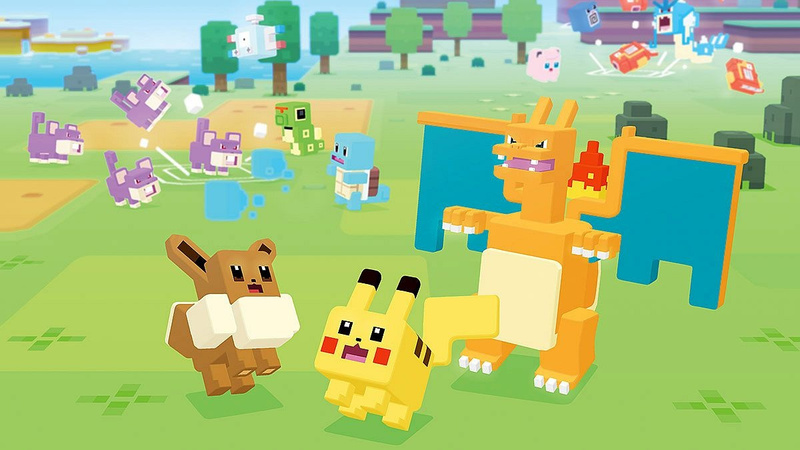 When the free-to-download title Pokémon Quest was launched on mobile at the end of June, it generated $3 million in revenue in its first week, with a total of 3.5 million downloads. It’s now been a month since the game's release and Sensor Tower is reporting players have spent more than $8 million on the mobile title during this period. The largest source of revenue is from players in Japan, who make up 34 percent of spending in total. The US places second at 24 percent and interestingly South Korea has contributed an additional 12 percent. According to Sensor Tower, the majority of revenue has come from iOS players - making up "66 percent of spending versus Google Play’s 44 percent". Spending has slowed overall since the launch of the game, with daily gross revenue coming in at around $30,000 on both mobile platforms. The best day for the game on mobile was apparently on 30th June - grossing more than $580,000. The download total is now around the 8 million mark. Have you made a monetary transaction in Pokémon Quest on mobile? Are you playing the Switch version? Tell us below. Well, full honesty? I fully expected numbers to drop off quickly. There is no recurring charges. You just buy it and then you're done. But eight million dollars is nothing to scoff at. And I actually appreciate this "You buy it and you have it" mentality over the loot box craze the world has recently been in. This would be impressive for an original IP, but this is Pokémon! Nintendo and Game Freak need to stick to consoles, instead of making lackluster mobile games. At best, this game is on track to make a bit more money than Mario Run, which was a historic underperformer for Nintendo. Pokemon Quest is no Pokemon Go. Not even in the same stratosphere. Pokemon Go is awful. (Doesn't mean I didn't get addicted for a few months though) Pokemon Quest was just weird though. I played until the first time I ran out of time and then it reminded me very quickly that it was a mobile game designed to get me to spend money on things that I'd get bored of very quickly. With Mario Kart Tour incoming, there is no chance Nintendo will abandon the mobile gaming market anytime soon. Gamefreak is a different story though, as they are a fairly small studio (relatively speaking) who is currently working on Let's Go and Pokemon Gen 8 2019 (and possibly even beginning pre-production on a Diamond/Pearl remake for 2020). Given that Pokemon Quest isn't anywhere close to being a huge success, I doubt they'll be making many mobile games for a while. @Equinox I don’t see the problem with expanding your brand awareness through movies and themeparks. A movie based on a game doesn’t make it automatically garbage,the lego movie is based on a toy and the whole Pirates of the Caribbean franchise on an attraction. You just need a good story and set of characters, and Mario already has the second one. iOS responsible for 64%, Android for 44%? Um, the maths doesn't quite add up there! Glad to see Nintendo finding further sources of revenue - it all feeds into the bottom line and raises the possibility of loss-leading vanity projects! We want more titles like Zelda BotW and Metroid Prime 4, which have enormous development costs compared with some other first-party titles. As for the game itself, never played it and am unlikely to start now. That voxel art style was cute when it broke through with the likes of Crossy Road, but it's become a mobile cliche since. I'll wait for the real Pokemon - but more power to Quest's elbow anyway. @Equinox Well they are on top of their themepark games. In the end it looks like Universal is building a remarkable piece of themepark history. Nintendo wouldn’t be able to build this on its own. But anyway that wasn’t the topic. Its not either A or B to succeed, Nintendo wants both of them to succeed. Guess people with play anything that’s Pokémon. I thought this game was awful. Can’t describe it any other way. On the other hand, my 6 year old has sunk a ton of hours into on his Switch & iPad. @westman98 It seems like outsourcing to cygames or DeNA (like with Mario Kart Tour) would be a better strategy for Nintendo and its partners with mobile games. DeNA handles the networking for Nintendo's mobile games. The core of Nintendo's own mobile games are developed by the studios who develop the mainline entries (Super Mario Run, Animal Crossing Pocket Camp, and Mario Kart Tour was/is being developed by Nintendo EPD; Fire Emblem Heroes was developed by Intelligent Systems). But Nintendo publishes mobile games so infrequently (1-2 releases per year) that I find the thoughts of "Nintendo focusing too much on mobile" to be concern trolling rather than actual concern. @westman98 What I've read is that Mario Kart Tour is being jointly developed by DeNA and Nintendo and it sounds to me like DeNA will be carrying more of the weight. It wouldn't be the first time for an external developer to develop a Mario Kart game. This is not meant to be a continuation or replacement of the Rumble line. Though I wouldn't be against the idea of using this graphic style in the next Rumble game.